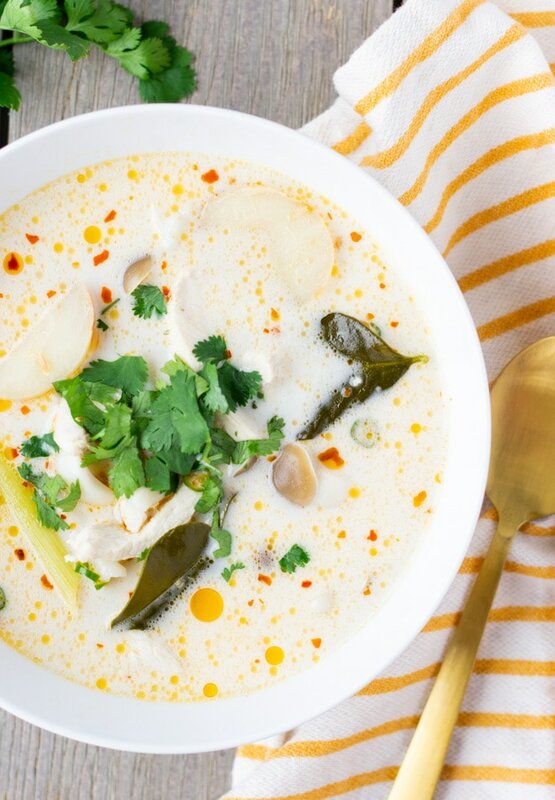 Tom Kha Gai is a spicy, fragrant, and creamy Thai Coconut Soup with Chicken. When I was coming up with recipe ideas, I remembered one of our last meals in Bangkok. It was late in the evening and we just had drove into Bangkok from Northern Thailand. My parents were too tired to eat, but we needed some food. Our hotel had a small restaurant downstairs so we decided to give it try. We were so hungry that I think we ordered half of the menu! One of the dishes we ordered was Tom Kha Gai, which translates to Chicken Galangal Soup. This was Danny’s first time having this soup since he had only had Tom Yum, which is similar, but Tom Kha has coconut milk. After trying it he was wondering why I never made it before! So I knew this needed to be part of our cold weather soup rotation. Tom Kha Gai may look complicated, but it actually comes together very quickly, no long simmering required. The only challenging part may be finding the ingredients. The aromatics that give this soup it’s unique flavor profile, are typically only sold in Asian Markets. I’ve seen some recipes substitute ginger for galangal, and I can say first hand it does not give the same flavor. This is probably one of the reasons why I don’t make this soup often, but when I do, it’s so worth it! 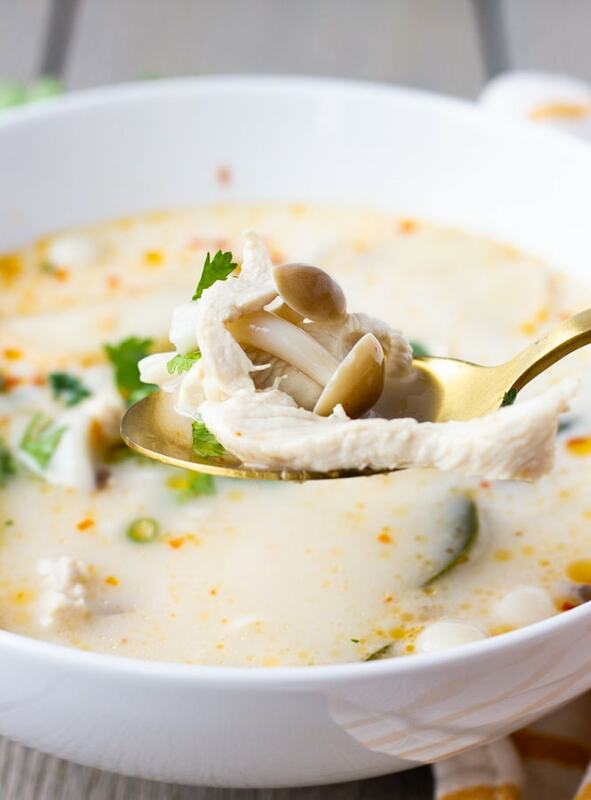 Thai restaurants here in the U.S. typically serve Tom Kha as an appetizer or as an addition to the main meal. In Thailand, Tom Kha is usually eaten as a meal with rice, similar to a curry dish. When I made it this last time around, I decided to boil some package noodles and make it a noodle soup. It was so good in a big bowl with lots of lime juice and Thai Chili’s. If you are sick or stuffed up, make it spicy and your sinuses will be cleared right away! Also lemongrass is great for when you have a cold. Natural medicine! 1 Galangal 4-5 Large slices, this is call 'Kha' in Thai and is necessary for this soup. You can find it at most Asian markets. 1 Tbsp Thai Chili Oil Not necessary, but will give the soup more color and some spice. Limes Squeeze anywhere from a half to 1 lime per a serving. But don't squeeze while the soup is cooking. 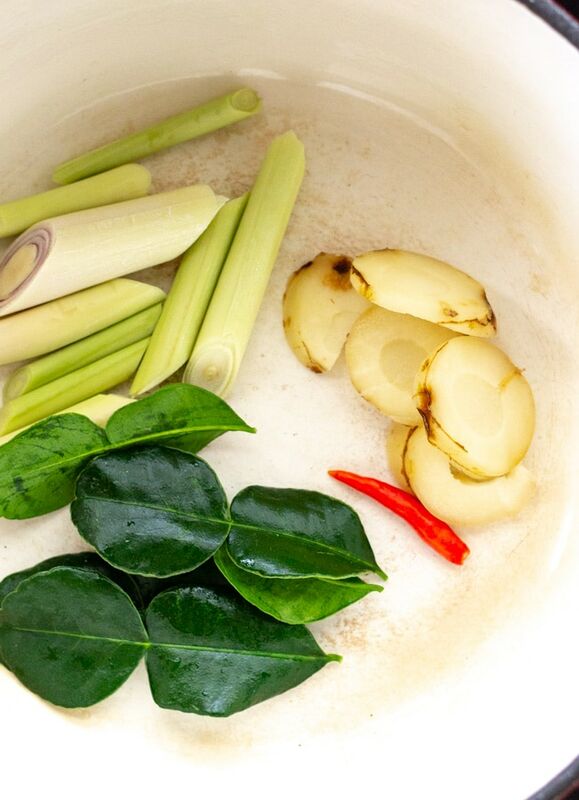 Add water, lemongrass, lime leaves, galangal, and chili's and bring to boil. Simmer for about 5 minutes to allow aromatics to season the water. With the water still simmering add chicken and allow to cook for a few minutes. Add mushrooms, and fish sauce. If you want to add chili paste then you can add it now. Lower heat to a low simmer and add coconut milk, stir slowly, taste and add additional fish sauce if needed. Turn off heat. Depending on how big your serving bowl is, squeeze anywhere from half to one whole lime in each bowl. Add extra sliced chili's for more spice and pour soup in bowl. 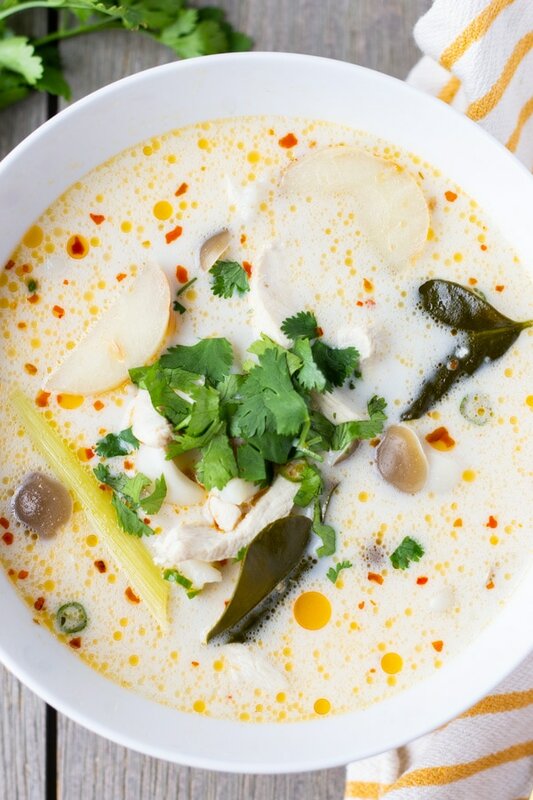 Thai's enjoy Tom Kha as a meal with rice, or you could boil some rice noodles and have it as a noodle soup. Top with chopped cilantro. 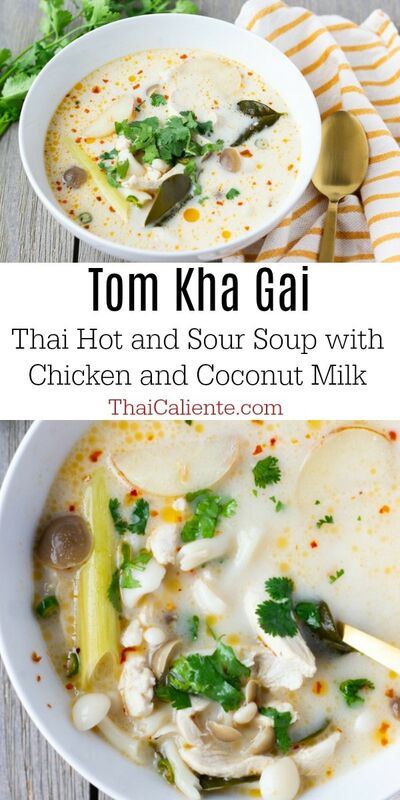 Tom Kha Gai is one of my favorites! We went to Thailand shortly after we were married, and at a restaurant in Bangkok that was known for its Tom Kha Gai, my husband ordered our meal Thai Hot. He was ok, but I still haven’t recovered LOL. Hope you are back on your feet soon! Ok Thai Hot, is like asking for a death wish!! LOL I’m feeling a little better, thanks so much! So glad you joined our party! Hope you join us again next week with more of your tasty recipes! Have a great week!